Since the dawn of the screenshot, we've been warned that once something's posted to the Internet, it's there forever. But, that's the beauty of it, too. Yes, we should all be thinking before we tweet/Tumble/Like/whathaveyou — even if our profile is set to private. For somewhere out there is a human taking screenshots of profiles and maybe even developing a digital archive to help other curious minds find some dirt like this. 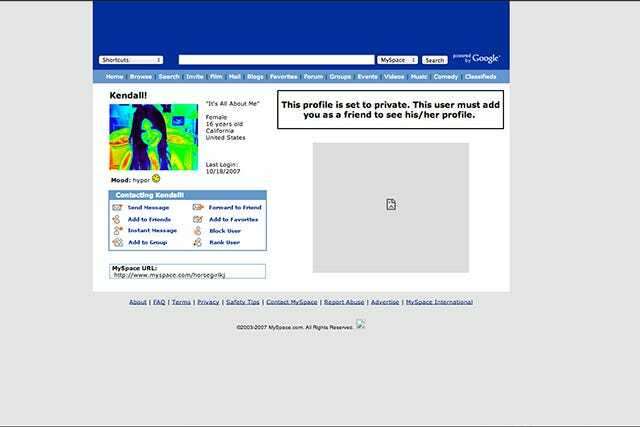 Anyway, while casually Tumbling through the Internet, one staffer here came across Kim Kardashian's old MySpace profile — her pretty, pretty pink profile. And, it made us very curious. 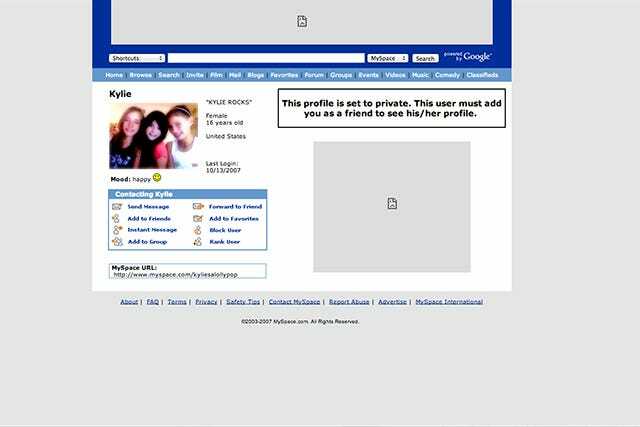 What other celebrity MySpace accounts are still kickin'? We just had to do a little Internet sleuthing, and we were able to find the profiles of seven of today's most buzzed about names, permanently etched into the digital fabric of 2008. If Top 8s were still a thing, these ladies would definitely be in ours — along with Tom from Myspace, obviously. This is the best thing on the Internet right now. All that pink. The princess reference. The one person she wants to meet is God. And, she built out her profile with the help of the venerable Pimp-My-Profile. When the time comes for Kim to be honored as some sort of career wizard, this will surely be featured. It would be a crime against humanity not to share how far she's come. 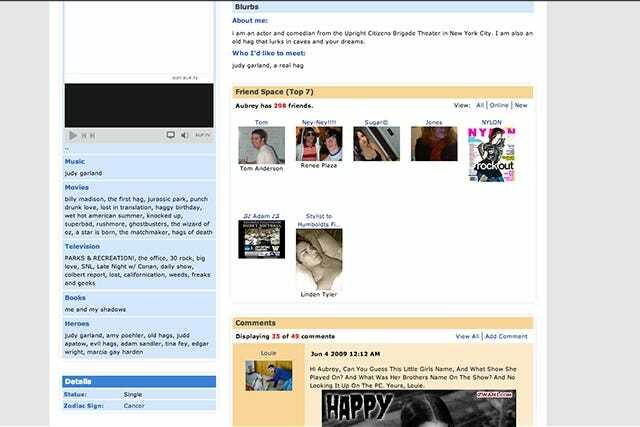 In the olden days, you had to be 16 to use MySpace. Kendall is 18 and Kylie is 16, which means these two lied about their ages just so they could fill out those bulletin-board quizzes and do a little C4C'ing (that's commenting on other profiles in exchange for comments on your own page). Behold, the "Ur So Gay" Katy Perry, fresh off her Christian label, and on the brink of candy-flavored pop stardom. She claimed she sounded like "butta" then. She's singing a different tune now. 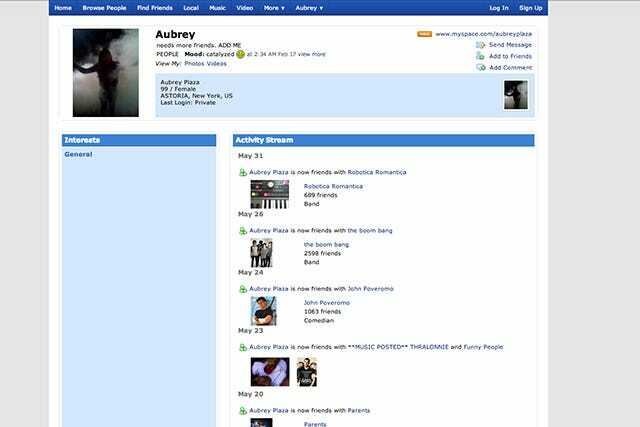 Currently, Aubrey Plaza's social-media profiles are all about her dedication to being an "old hag." Turns out the Aubrey Plaza of My Space, who only had a Top 7 and less than 300 fans, was also an "old hag." Just look at her Heroes and About Me! It's common knowledge that Lana Del Rey didn't get her start as Lana Del Rey. Here's digital proof that Lizzy Grant was real. She was still pushing the whole America thing with an animated firework background. 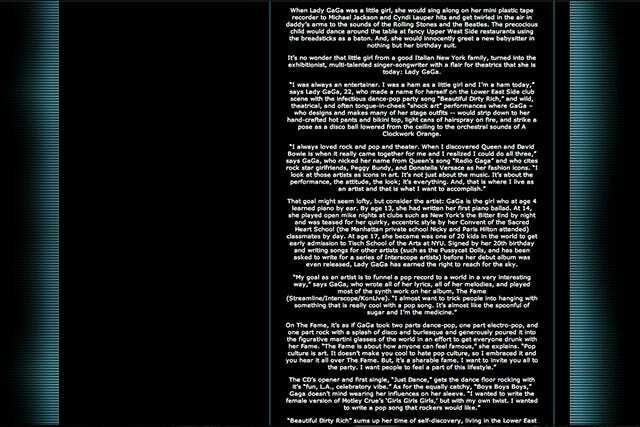 The text on her page was annoyingly black on black background, so we highlighted it to make it easier for you to read. This is Gaga pre "Just Dance" — a futuristic disco queen from the world of Zenon: Girl of the 21st Century. Her About Me is riddled with Gaga-isms and deep artistic conviction. She's cocky and mysterious. There's a sense she's maybe, as the kids would say, "a hot mess." But, this is what started it all. This is what made Gaga who she is today. This and, well, Akon.